First, we would like our patients to understand dental implants, so they feel confident and comfortable when making the decision to do an implant procedure. A dental implant is made of strong and lightweight materials to replace a missing tooth or teeth. It is outlined in 3 different parts: the first part is the implant device which is placed within the bone. In cases that lack bone, Dr. Buitrago can discuss options to place human or animal bone as well as use your own plasma to allow the implant to integrate to the bone. The second part is the abutment which is like the middleman between the implant and the final part, the crown. The abutment maintains the implant and the crown connected. An important aspect of implants is osseointegration. Implants need to osseointegrate with the jawbone where they are placed. Procedures like L-PRF (your own plasma is used) and bone grafting make it possible for the implant to osseointegrate. These procedures help the bone grow around the implant in order to strongly hold it in place. Finally, the crown is made according to the size, shape, color and fit that is best for your smile. We want you to be able to have the most natural and beautiful smile possible. According to the American Dental Association, “Most patients find that a dental implant is secure, stable and a good replacement for their own tooth.” (1). Not only are dental implants an exceptional treatment option, but as a patient you also want top-tier care for your smile. Dental implants are an investment towards your oral health. When comparing other treatment options such as dentures or bridges, implants are definitely the better choice. 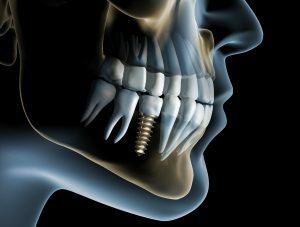 The benefits of implants are that they provide more stability in your mouth, feel more real and comfortable. Implants are a durable option to maintaining a healthy and aesthetic smile. Now, that you understand the procedure and science behind implants. We can offer you the best services and answer any other questions you may have.